This is not what I planned to be reading this week. For starters, I just didn’t plan to read this many, because for quite awhile there I was having trouble finding time to read. Doing all these challenges and making a habit of reading every day has re-awakened my love of reading and made it so whenever I have down time, I think “What could I be reading now?” and eagerly head toward my stack of comics. But with these comics in particular, I wasn’t really aware of the theme when I chose them. I knew next to nothing about the plot, but added things because they’re all starting new series and I liked the author (Hulk) or the character (The Mighty Captain Marvel, “Batwoman Begins”) or the new take on an old concept (Mother Panic). I’ve only read one She-Hulk trade. It was the book of the month for my local comic shop and I figured “meh, why not?” I’ve never had much interest in any of the Hulks and haven’t really had much desire to read them since, but I did enjoy that particular book. And when I saw this new series on the shelf with the “she” dropped, some really nice artwork, and Mariko Tamaki writing it, I decided it was time to try again. It’s so good, easily my favorite of everything I read this week. It references a lot of things I didn’t know happened and Jennifer’s (that would be the Hulk, formerly She-Hulk, if you’re not familiar) anxiety about them and about moving on with her life. The writing here feels familiar and realistic. It’s comfortable to read despite the difficult subjects. I don’t need to know what happened in the previous storyline to instantly relate to Jennifer and become invested in her story. Her inner monologue feels like my inner monologues and so doesn’t come across as contrived, over-dramatic, or overly self-aware (all problems that I’ve noticed turn me off some comics). And since we start wrapped up in her mind, experiencing that solitude and anxiety with her, the sudden intrusion of social interaction is just a bit anxiety-inducing even to read. It’s a very immersive story in general and I appreciate being able to experience the mind of this character I really don’t know well following circumstances I deliberately avoided. Seems like it’ll be a good introduction. Captain Marvel is a much more familiar character for me. One of my favorites from Marvel, as you might be able to tell from the picture to the right. Only about half the size of my Batgirl collection, but definitely more than I have for any other comic character…at least now that I’ve put most of my Captain America stuff in storage until Nick Spencer stops writing it. Like Hulk, Captain Marvel (Carol Danvers) is struggling with the events of Civil War 2, where apparently (spoilers) she might have killed Tony? Or come close to it? So she’s having bad dreams and talking them out with a digital therapist (or a real therapist that she talks to through a really good virtual reality program? I can’t quite tell but went with the AI explanation) until she gets fed up and turns it off. 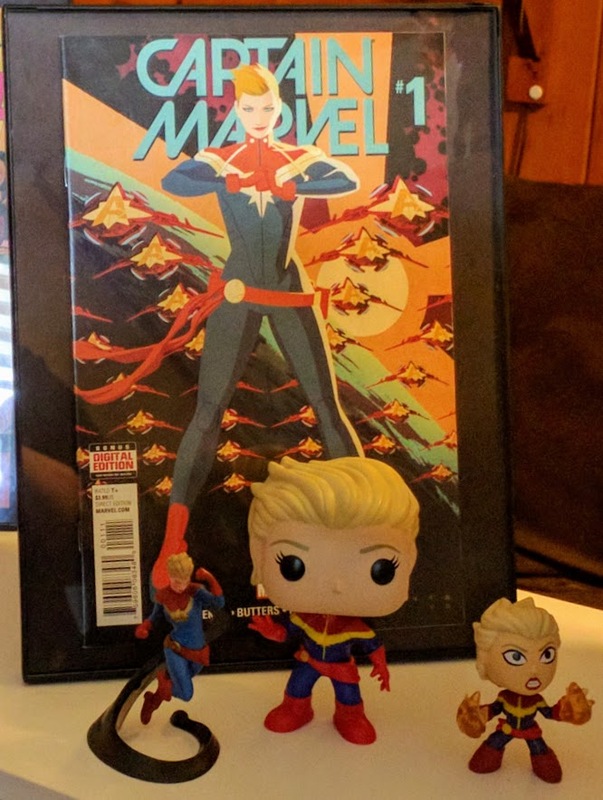 She’s Captain Marvel, she doesn’t need to talk about her feelings! She can swallow a sun, you know! We see some of her past and are reminded along with her that she’s not amazing because she has superpowers, she was always the best and most determined and fully willing to take matters into her own hands to reach her goals. She’s done a lot of that on her own, but now she has a great group of people who care about her and it’s nice to see her fall back on them at the end of the issue. I don’t read Batman comics. I waffled a bit over reading even these two, because they’re an intro to Batwoman’s new solo series but they’re also Batman. Ew. But I like both writers and I’m excited for the new series so I gave it a shot. This is a little outside the theme/title of this post, really. I wouldn’t say there’s any overt suggestion she’s struggling with PTSD or really any sort of anxiety. But I include it because…she probably should be? One of the reasons I’m interested in this theme from the others on the list is because superheroes don’t often show this sort of ordinary human experience. They’re constantly fighting, constantly seeing horrible things, and they’re mostly fine about it. Despite the fact that, you know, Batman and Batwoman are both obsessed with fighting crime because of terrible things that happened to them. These are not and probably shouldn’t be portrayed as healthy well-adjusted characters, is what I’m saying. But I like the acknowledgement in this that although Batwoman’s motivations and mission are different from her cousins (a fact he accepts), they’re both really fighting because of what was taken from them. They’re both sort of stuck in this childhood trauma and doing whatever they can to deal with it. I also like the queer representation in these issues, though the revelations were a bit clumsy. Dead names are dead for a reason and it felt really odd to me to have the trans character referencing hers and therefore immediately being like “HI I’M TRANS” to this person she just met. But everyone’s different and I’m sure there is someone somewhere who actually does this. Similarly, Batman pointlessly bringing up Kate’s “problematic relationship” seemed kind of weird, like it was there just to remind the readers she’s a lesbian and maybe get some cheers rather than because it actually serves the story. Just slightly less than natural-feeling to me. But that’s a personal opinion and I still think overall the writing is good. There are some glimpses of what’s going on in her life right now and what’s happened recently, without rehashing everything in too much detail. I look forward to learning more in her own series. Did you know DC had an edgy books imprint headed by Gerard Way? I did not. But they do and this is a part of it! I was drawn to this book because of the costume and cover art. I did some research and discovered it’s written by a woman, features a new Gotham…masked-fighty-person (not sure yet whether she falls closer to hero or villain) who has a similar dealing-with-trauma story to Batman and Batwoman but with way more emphasis on the trauma. Gotham? Female character? Brand new character? With a cool costume? And an acknowledgement that this is not a healthy lifestyle and maybe even actual focus on mental health concerns? YAY. I didn’t love the first issue, just felt a little rushed and didn’t give me enough to go on. But the second made up for it and I’m a lot more excited to read the next and see where the author’s going with this. There’s this interesting thing the artist does that I’m not sure I understand right. But I think it’s supposed to represent intrusive images? When she’s in combat, there will be these single-panel flashes of disturbing things like a swan (goose? duck? I don’t know) shot through with several arrows or a snake eating a rat. Memories? Just imagination? Something to get her through combat or things triggered by it? Don’t know yet. But it’s interesting. And since that’s a symptom of PTSD and other anxiety disorders I thought it was a unique way to show her mental state and bring us into the experience without using words. I like it. What cool new things did you discover last week? Any recommendations? Have you read any of the ones I listed here, and what did you think of them if you did?